Nearly every religion down through the ages has taught some version of the proverbial Golden Rule: people should treat others in a manner in which they themselves would like to be treated. I am convinced that having a purpose beyond your own selfish interests is one of the strongest determinants of our long-term health, attitude, and even life expectancy. Altruistic activities such as investing one’s time and energy in mentoring others, or volunteering to help those in need, tends to promote feelings of well-being and bestow upon us a strong sense of purpose in life. 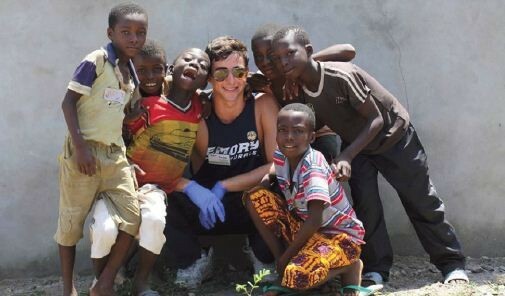 Evan, our 21-year-old son, has spent a portion of each of the last two summers in Ghana, Africa as a volunteer for Emory’s Medical Brigades. In this endeavor he works with a small team of medical personnel providing the basic health needs for people in impoverished villages suffering from serious issues including malnutrition, malaria and HIV. Try to seek out endeavors that allow you to find meaning outside of yourself. This passion for a cause bigger than yourself reconfigures your gene expression, which can transform your health for the better - preventing depression and strengthening your immunity. On the other hand, hedonic happiness - the short-term gratification one gets from materialistic things like new purchases and selfish pleasures - does not seem to confer these profound benefits to long-term health and longevity. The key to volunteering is finding an activity where you feel as though you are making a positive difference, even if it’s subtle, in your little niche of the world. Edward donates his time to plant and nurture flowers and trees in his neighborhood park. Rachael, age 18, is a senior in high school who loves animals. She donates her time on two Saturdays a month to help walk dogs and play with cats at an animal shelter. These kinds of endeavors kindle a warm glow of deep contentment that makes a real difference to the giver’s health. All life on Earth is connected - and no organism can survive alone. In so many ways life is a wondrous complex cooperative endeavor. For example, plants using sunlight via the process of photosynthesis combine carbon dioxide - the gas we breathe out - and water and to grow food and nutrients that we animals need to thrive. And in a synergistic collaboration, the plants give off oxygen as a waste product, which of course breathes life into us. In turn, animal waste products (both liquid and solid) are loaded with the nitrogen, phosphorus and potassium that makes perfect fertilizer to help plants flourish. In other words, plants and animals are connected in an elegant, tightly linked, co-dependent cycle that is necessary for survival of all life on the planet. A recent survey found that four out of five doctors said that if they were stranded on a deserted island without lawyers, they wouldn’t need any aspirin. Although it’s true that many physicians tend not to be fond of lawyers, my father was an attorney before becoming a judge, and some of my very best friends are lawyers. Warren Buffett, the “Oracle of Omaha,” is widely acknowledged as the smartest and most successful investor in history. He remains on top of his game as CEO of Berkshire Hathaway. He still lives in the same house in Nebraska that he bought in 1958 for $31,000, and he drives himself around in a Cadillac he bought seven years ago for $42,000. He doesn’t carry a cell phone, and has no computer on his desk. Although just reading about his diet is enough to make me sick, he seems to be thriving despite being in the middle of the ninth decade of life. His typical lunch, the same one he’s been scarfing down since he was a kid in the 1930s, is a hamburger with fries, washed down with cherry Coke; dessert is vanilla ice cream slathered in chocolate syrup. His beloved snack is See’s candy, and his favorite “exercise” is playing cards - about 12 hours of bridge per week. So, in many ways Warren Buffet is not exactly a poster-boy for cardio-wellness, yet he will be celebrating his 84th birthday this summer while still enjoying excellent health. Sure, he had a little scrape with prostate cancer a couple of years ago, but Warren received radiation therapy and barely missed a day of work - just a speed bump along the road of life. I believe that a major reason that Warren Buffet remains so robustly healthy despite his age and less than ideal diet/lifestyle is that he is intently focused on doing everything he can to make the world a better place. The best way to help oneself is to help those around you. Call it what you want: God’s sacred design, Karma, Gaia life force, or evolution via kin selection favoring the survival of cooperative individuals. For life to survive, we need to work together to help one another. Life in its wisdom tends to instill strength and vigor into those who are contributing to the good of the whole, and withdraw vitality from isolated and selfish individuals. Excessive selfishness can ruin lives and destroy health and true joy. You will discover that the more you give of yourself to the people, living creatures, and plants around you, the more fully life will invest back into your own health and wellness. You don’t need to be giving away vast sums of money, curing AIDS, conquering cancer, or solving the global climate change crisis to feel the strength that comes from helping others. Go out of your way to be considerate and helpful to your elderly neighbor. Be there for your friends when they are going through tough times. Go the extra mile for your co-workers; help a stranger in need. Be a source of happiness and encouragement for the people with whom you interact. Walk your dog, tend your garden or pet your cat. Sometimes, in our day-to-day existence we tend to take for granted the people who mean the most to us. So I personally am trying to make a point of being a more loving and considerate spouse, parent, son, uncle, brother, physician and mentor.